Living in an apartment or a house with small kids can be a challenge. There are two options: you want to keep your home tidy so you can open the front door every moment for unexpected guests. 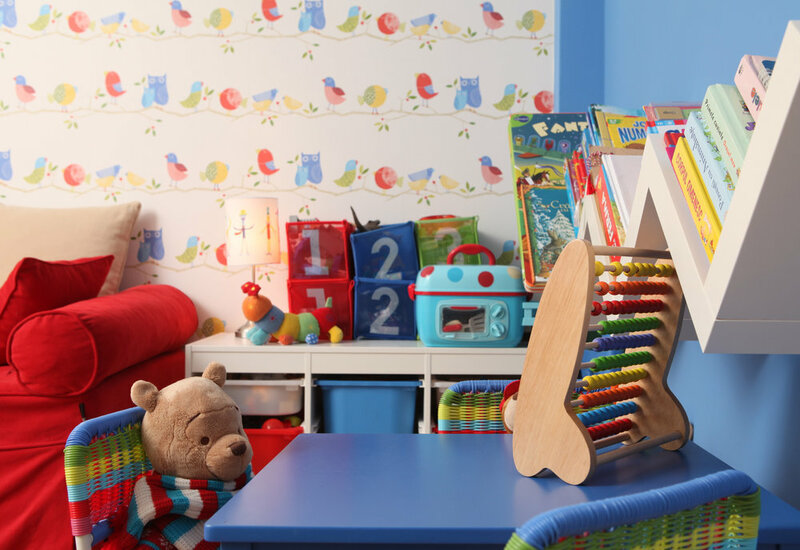 Or your kids will make that your home will get a colourful and kids friendly touch, which does not mean it has to be a playroom all around. From the entrance to the bathroom and beyond, your home has to accommodate the wear and tear that goes along with family life. Just because you have kids doesn't mean you have to give up on your design style. I got to know Andreea a few years ago when she was pregnant of her second child and they were going to move into an apartment. A few years later she asked me to take a look at a house were they wanted to move in. The house was quite dark, the open kitchen in dark wood was the biggest reason she hesitated to change their apartment for this house. The family loves colour, the kids are playful so it was not difficult to bring joy and colour to their new home. The sofa in the living room is used on a daily base. So not to go crazy that the kids will make your precious sofa dirty with their hands covered by mud, or dripping ice cream on it, buy a sofa in a dark colour. Upholstery fabrics are finished with a kind of protection, so if you clean it immediately the stain will disappear. Ok, wine or coffee stains can be another story. And what do you think by changing your traditional coffee table for an ottoman? The corners are rounded, nobody can fall on the sharp angles. You will see the kids love to lay on it watching tv. And than you say: but what about serving a drink when you have visitors? A big tray on the ottoman will give your living area a very elegant look. We added also a big round arm chair with a diameter of 120 cm, you can see that this is their preferred place to hang out with mum or dad. When they moved in their new home we first had a lighter wallpaper, with a delicate pattern. When they decided a year later that it was the moment to change the kitchen I called Andreea to come and take a look on a new wallpaper of Thibaut which just arrived. Is a kind of dessin, specially in this colour combination, you can't propose to everybody but I knew it was just perfect for Andreea and her family. She loved it as much I did. So when they came to install the kitchen it was time to install the new wallpaper. The living - dining - kitchen area is one big open space. You could breath much more once the dark kitchen was replaced by a bespoke kitchen by La Maison. It finally seemed as the light was filling the room. A big open space makes it easy for everyone not to feel separated, specially kids will feel more comfortable. The kitchen is in a light warm beige tone, the countertop is in a darker tone of composite. The floor reflects again the playful spirit of the young family, a patchwork of plain coloured cement tiles. Even for a family loving colours I wouldn't suggest to have a colourful painted kitchen, times are changing, moods are changing and yes, you can repaint your kitchen but it is much easier to have colourful accessories, plates, cups. A kitchen should always be practical, even more with kids. All should have its place: cereals, nuts, seeds all stored in glass jars makes it easy to find them back in just one look. Every corner can be used, every drawer can be personalised according the needs of the owners, when you go for a bespoke kitchen. No standards, so every detail will be discussed to make your kitchen easy and a pleasure to cook in. A family house or apartment should be practical from the first step you enter. Coats, backpacks, and school stuff should find their place. So hooks will have a multi-purpose. In Andreea's small powder room we looked for a tiny wash basin to put on a furniture so some small things could be stored away. The wallpaper from the Whimsical collection of Cole & Son brings a touch of magic. In the apartment where they lived, before moving into the house, they had the choice to give each kid their room but they went for another option: the kids would share their room and so they could have the biggest room in the apartment as their playroom . All the toys could find their place to be stored. A colourful painted wall, some wallpaper and striped curtains have set the look for this room. The extensible sofa could be perfect when the grand parents would stay the weekend. Kids are growing quickly, you will have to adapt their room often to their different stages in life. As they had a dedicated playroom there were no toys laying around in the bedroom. All the toys could be stored in bins and in the big drawers. So when they moved to the new house the kids were a few years older, a desk was needed as the boy would soon go to first grade. The house has only 2 bedrooms, so the kids are still sharing their room. The playroom is on the ground floor. So in a small room, shared by two kids, you have to make sure everything as a place. For them to finds things back and for you it will be much easier to clean up. 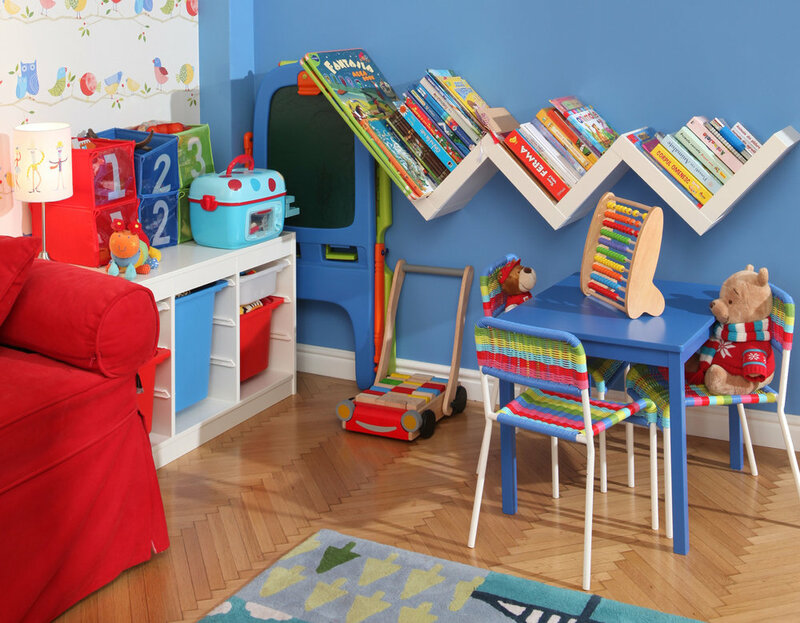 Kids' room should be just pink or blue, but they should be colourful. Colour will give them energy, will inspire them. The birds they had on the wallpaper in the apartment took place for the Splatter wallpaper of Sanderson. You can find a lot of wallpapers to inspire first grade kids to study in their room at their desk. In a small room look for bunk beds as it will give you more space. 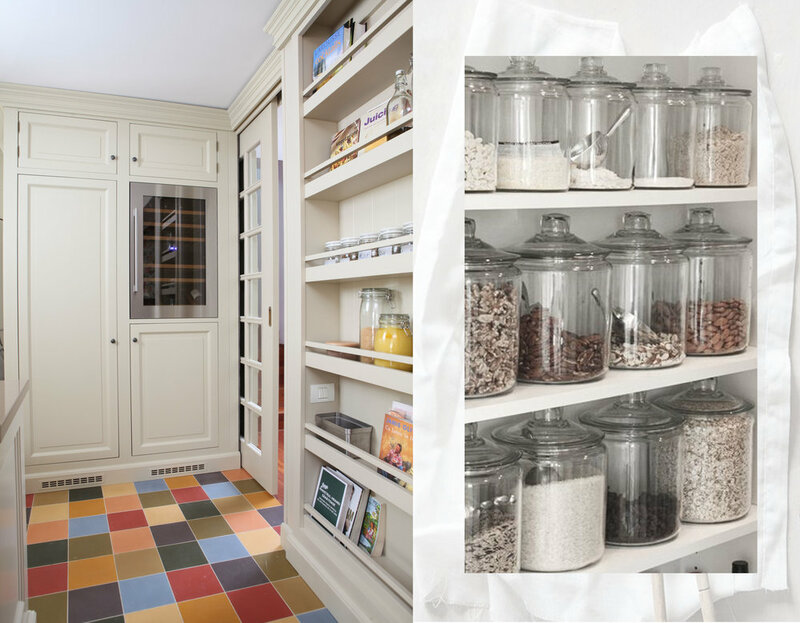 Use as much as possible the vertical space in a room to store things. And store as much as possible in boxes, bins, on shelves. Soon Andreea will get to a next step in life: it is time to make an extension to the house, so both kids can have their own bedroom. I can't wait to redecorate all the bedrooms. 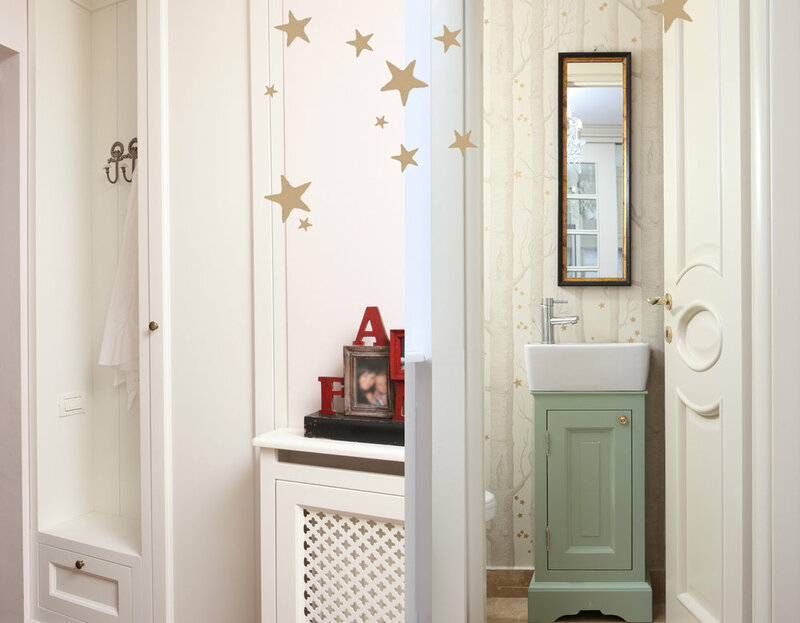 look for storage solutions from the entrance till the bathroom and beyond. Create an environment in which your entire family feels comfortable. Designing a home with kids in mind should be fun!